Matt Moore is in a happy place. 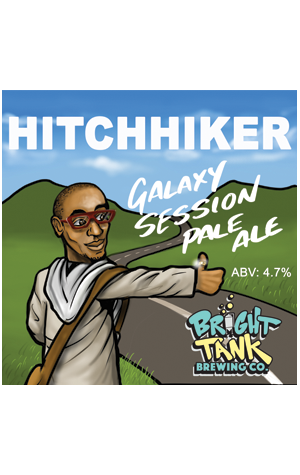 Not only does Hitchhiker represent the debut canned release from the East Perth brewery, it also seamlessly weaves together his love of hip hop (check Mos Def on the label), Douglas Adams' classic novel and beer from his own brewery. It’s a quartet that may well contain the answers to the universe but for many it’s more likely to be an enjoyable session beer. True to its name, Galaxy hops ring clearly throughout, most notably in the passionfruit and pineapple aromas. These hitchhike on the palate with a subtle melon and supportive yet firm bitterness in a light malt body. With so many references to the Hitchhiker’s Guide to the Galaxy, it’s a wonder this didn’t arrived with an ABV of 4.2 percent. And, if you're not sure why, we apologise for the inconvenience.